This is a celebration of storytelling, from cave dwellings to our digital age. Enjoy! 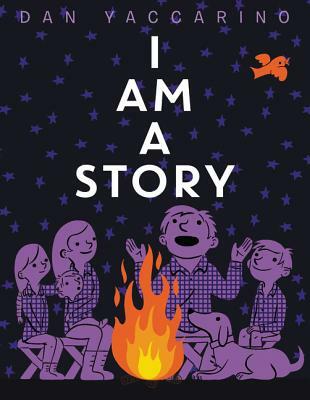 Internationally acclaimed author-illustrator Dan Yaccarino presents a powerful picture book that celebrates storytelling—from the past to the present and beyond. With simple text and delightful illustrations, Dan Yaccarino reminds us of the power of story. A Junior Library Guild Selection and a Chicago Public Library Best Book of 2016! Dan Yaccarino is an internationally acclaimed author-illustrator with more than thirty children’s books to his credit, including I Am a Story, Five Little Pumpkins, Five Little Bunnies, Trashy Town, and Giant Tess. He also created and produced Nickelodeon’s Oswald and is the character designer behind The Backyardigans. You can visit him at www.yaccarinostudio.com.